Many people have no trouble finding individual pieces of clothing that they like, but are unsure of what to wear with what [else]. I am planning a series of posts on this question (working title, This Goes with That!™) because there are a number of things to consider: colors (complementary, numbers, and placement), silhouette, formality, fabric, etc. To tide you over, I will offer one easy piece of advice right now. You will always look put together if you wear either: (1) a jacket (or sweater) and blouse in the same color with a pair of taupe, grey or black pants (e.g., red sweater, red blouse, and grey pants) OR (2) a sweater (or blouse) and pants in taupe, grey or black with a jacket (or sweater) of a different color (e.g., grey shell, grey pants, and red cardigan). 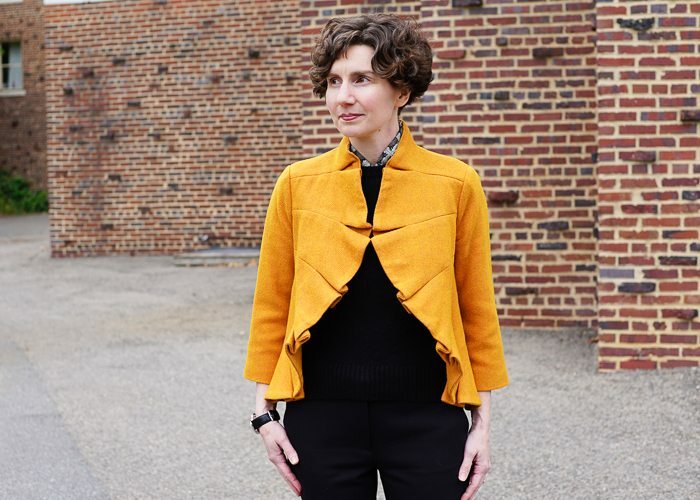 A black sweater, black wool twill pants, and an orange jacket that looks like a clam-shell! This cut is not the most practical, because it can’t, really, be closed. And because it can’t be closed, it will never look svelte. But nevertheless, it’s distinctive and charming, right? The jacket is made of a very rough woven wool. 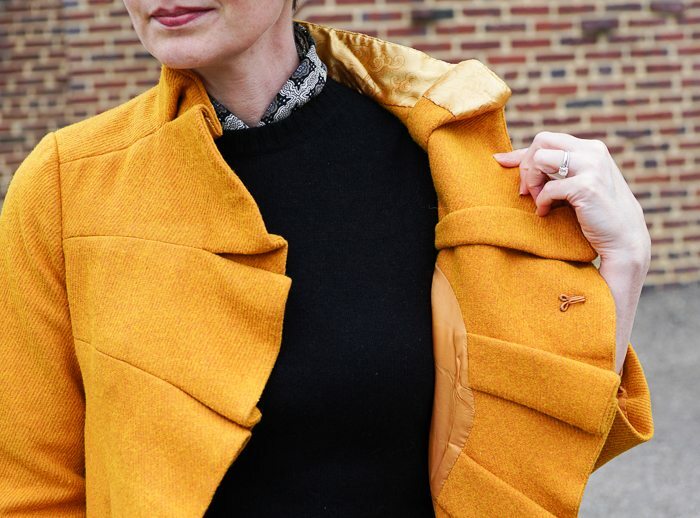 I generally prefer soft fabrics that are comforting to touch, but I didn’t think the texture would bother me because I would always be wearing something underneath it. Wrong! That stand collar scratched the back of my neck, even with a little scarf tucked into the neckline of my sweater. So I went to the fabric store to purchase a lining fabric. For those of you who sew, you know that fabrics sold as liners tend to be inexpensive synthetics. 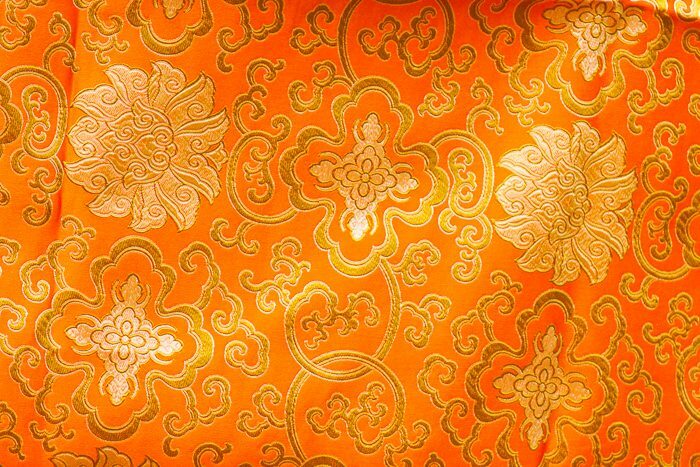 I wanted something more luxurious, so I drifted to the Chinese silk brocades, which feature the most beautiful, intense colors. I picked out something that would coordinate with the color of the jacket, and then decided to use the reverse side (a trick learned from reading about the interior design work of Nancy Lancaster), which is as well finished as the front. Am just realizing that I failed to take a snap in profile, so that you can see how the jacket falls from the side . . . Will have to amend this post in the near future. 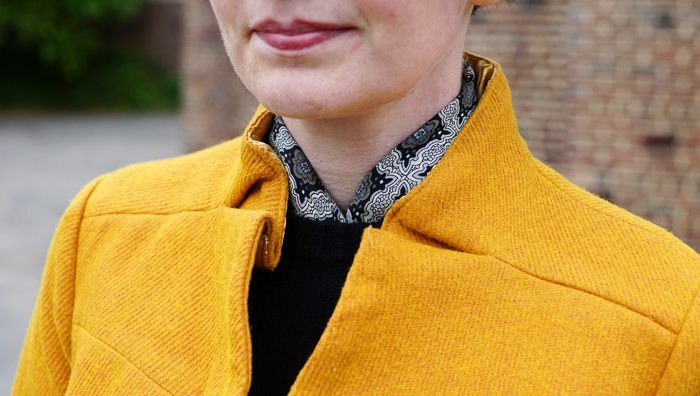 Very clever, to line the neck of your jacket, and in a Chinese brocade turned backwards! Wonderous! I know who would think this so … The author of a certain little book about elegance, is who. 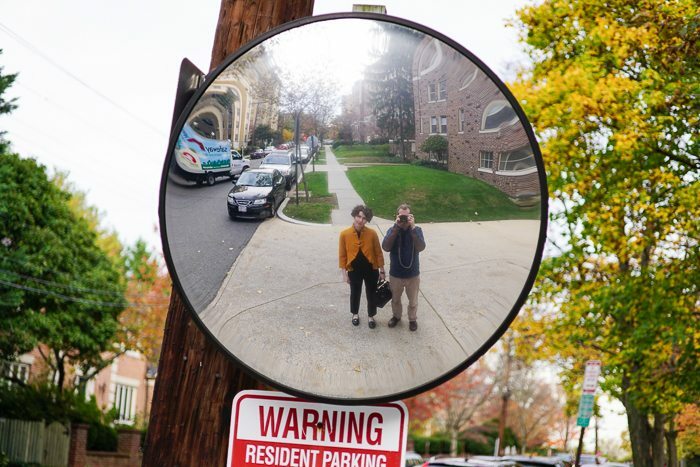 The round mirror reflected photo of the two of you and your lovely streetscape backwards is my very favourite photograph on your blog ever. Very ‘through the looking glass’ Directrice! Hi Justine — I am so glad you like that picture! I thought it was hilarious, and yes, you can see a little city in the background, including a distorted grocery delivery truck. Just lovely! 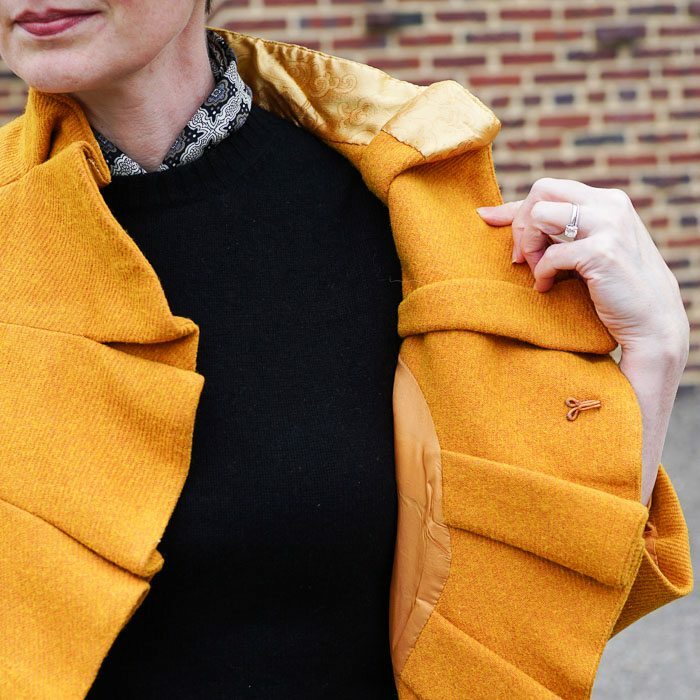 That saffron-and-black color combination is wonderful, and the cut of that jacket is definitely worth adding lining to make it work. A variation on your formula #1 that I have been noticing recently and that really appeals to me is jacket (or sweater) + blouse in tonal variations on the same color. Usually with the lighter version of the color on the inside (blouse). For example, a deep teal-green sweater worn over a celadon-colored blouse. I think this is really elegant, and it avoids any risk of a twinset look or sharply cutting yourself in half at the waist as might occur if the top and topper are super matchy. 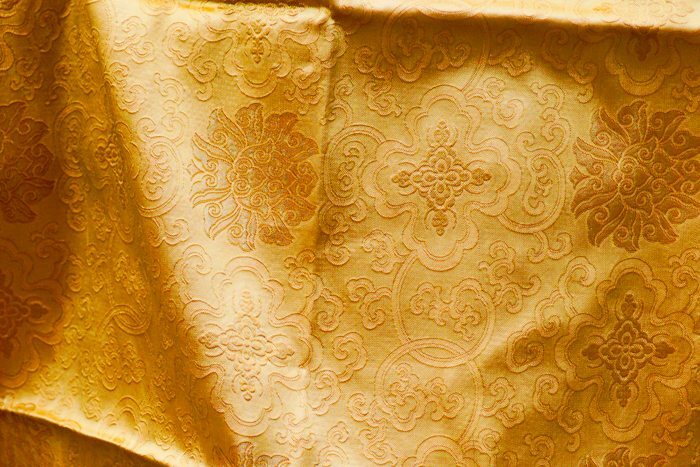 I like the way the texture of the brocade echoes the pattern in your Liberty scarf! Actually I am really glad you are wearing a Liberty scarf again today. Ever since your post last Monday I have been meaning to ask if you would do a post on how you tie your Liberty scarves. I have several that I have also bought on Ebay, but I don’t wear them as often as I would like because it’s difficult to figure out how to drape/tie them in a modern way. I feel like current scarf style is very casual — loop around neck, and you’re done — which I like well enough but doesn’t work with those smaller vintage scarves. It’s the 22-23″ and 25-26″ ones that flummox me. Would love to know how you achieve that “faux blouse” look that you’re wearing today, as well as any other tricks you have. Hi Sarah — I start drafting a post on The Virtues of Little Scarves months ago! I’ll try to finish and post it this week or next. Perhaps (perhaps) there will even be a video. I agree with you about combining shades of the same color; it can be a beautiful (and sometimes complex) look. For my purposes, I often wear a blouse and jacket or blouse and sweater that are close but not exactly the same shade. Thank you, Kate. Saffron is such a great color. Jodie — You are very observant. The jacket did come with a hook-and-eye closure, but as you can see, it’s set back from the edge of the opening. If it were actually hooked, it would create a very strange ridge straight down my front. Spinosaurus! Very nice. It’s like a scarf that goes just with that jacket. When I read of people bemoaning that they don’t know how to wear scarves I always move back to their functions -keep you warm, shield a scratching neckline, add a little color. I’m a little behind on reading your posts but I always enjoy them so! Great fix for the collar problem. I have a jacket with a stand-up collar that is too scratchy. I was contemplating having the entire collar replaced, but I like the idea of a lining. You are so clever. Thanks for sharing.